Many of us do not like physical activities and enjoy sitting in front of the TVs or PCs. Undoubtedly, this is not too good and various physical exercises should become an integrated part of our daily life if we want to be fit and healthy. At the same time, lots of people are truly found of aerobic exercises like walking, cycling, jogging, swimming, playing tennis, or anaerobic workouts, like weight lifting, stretching, yoga, sprinting, etc. Both aerobic and anaerobic physical activities are necessary for developing good physical fitness. However, sometimes we exercise really hard till our muscles start aching and pleading for some rest. In order to recover after lengthy workouts, some people use sports drinks like protein shakes or other drinks with carbohydrates. Recently, a group of American researchers found out another very effective way to speed up our post workout recovery. According to the findings of the study leaded by John Ivy, Ph.D., at the University of Texas at Austin, eating whole-wheat cereal with nonfat milk after exercising can facilitate post workout recovery and shorten recovery period to a great extent. During the experiments, Lynne Kammer, a specialist form the researcher group, was supervising the workouts of 8 male and 4 female athletes on stationary bicycles. After the workouts they were offered either special sports drinks or a bowl of 100% whole-what flake cereal with nonfat milk. 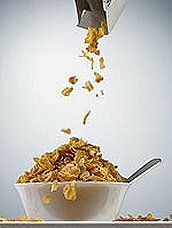 Both treatments could rise the insulin levels in the blood of the participants, but cereal proved to be more effective since it also blunted the rise in blood lactate and showed greater potential for glycogen storage, thus it turned to be more effective in rebuilding the damaged muscle tissues. “We were surprised that blood lactate was lower after cereal, possibly due to glycogen storage. In addition, the muscle was ready to store additional glycogen after the cereal-and-milk regimen, even after glycogen had already been synthesized,” Kammer comments. The results of the research were presented in New Orleans at the 54th Annual Meeting of the American College of Sports Medicine (ACSM). Therefore, if you are exercising somewhere close to your home, it is better to skip the drinks and grab a bowl of your favorite whole-wheat cereal with a glass of refreshing nonfat milk. Exercise and be always healthy and fit! Shopping vs. Workouts: What Can Help Us To Be Fit? When you are craving for sugar its because your blood sugar’s low – try to balance your carbs with protein. Cereal with milk or yogurt are good post-workout foods, but for breakfast and other meals its best to balance carbs with protein. Vänligen besök stenhård.com för att lära mer om populäraste medicinerna mot impotens.